Celebrating the spacecraft's ability to push the boundaries of space science and technology, NASA's Spitzer Space Telescope team has dubbed the next phase of its journey "Beyond." "Spitzer is operating well beyond the limits that were set for it at the beginning of the mission," said Michael Werner, the project scientist for Spitzer at NASA's Jet Propulsion Laboratory in Pasadena, California. "We never envisioned operating 13 years after launch, and scientists are making discoveries in areas of science we never imagined exploring with the spacecraft." NASA recently granted the spacecraft a two-and-a-half-year mission extension. This Beyond phase of the Spitzer mission will explore a wide range of topics in astronomy and cosmology, as well as planetary bodies in and out of our solar system. Because of Spitzer's orbit and age, the Beyond phase presents a variety of new engineering challenges. Spitzer trails Earth in its journey around the sun, but because the spacecraft travels slower than Earth, the distance between Spitzer and Earth has widened over time. As Spitzer gets farther away, its antenna must be pointed at higher angles toward the sun to communicate with Earth, which means that parts of the spacecraft will experience more and more heat. At the same time, Spitzer's solar panels point away from the sun and will receive less sunlight, so the batteries will be under greater stress. To enable this riskier mode of operations, the mission team will have to override some autonomous safety systems. “Balancing these concerns on a heat-sensitive spacecraft will be a delicate dance, but engineers are hard at work preparing for the new challenges in the Beyond phase,” said Mark Effertz, the Spitzer spacecraft chief engineer at Lockheed Martin Space Systems Company, Littleton, Colorado, which built the spacecraft. 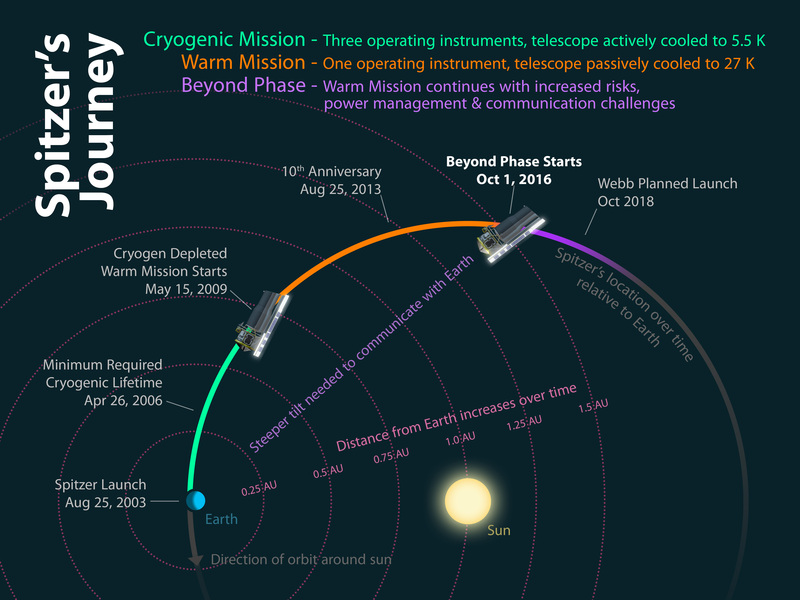 Spitzer, which launched on Aug. 25, 2003, has consistently adapted to new scientific and engineering challenges during its mission, and the team expects it will continue to do so during the "Beyond" phase, which begins Oct. 1. The selected research proposals for the Beyond phase, also known as Cycle 13, include a variety of objects that Spitzer wasn't originally planned to address -- such as galaxies in the early universe, the black hole at the center of the Milky Way and exoplanets. "We never even considered using Spitzer for studying exoplanets when it launched," said Sean Carey of NASA's Spitzer Science Center at Caltech in Pasadena. "It would have seemed ludicrous back then, but now it's an important part of what Spitzer does." NASA’s Spitzer Space Telescope, which launched Aug. 25, 2003, will begin the “Beyond” phase of its mission on Oct. 1, 2016. Spitzer has been operating beyond the limits that were set for it at the beginning of its mission, and making discoveries in unexpected areas of science, such as exoplanets. Spitzer has many qualities that make it a valuable asset in exoplanet science, including an extremely accurate star-targeting system and the ability to control unwanted changes in temperature. Its stable environment and ability to observe stars for long periods of time led to the first detection of light from known exoplanets in 2005. More recently, Spitzer’s Infrared Array Camera (IRAC) has been used for finding exoplanets using the "transit" method -- looking for a dip in a star's brightness that corresponds to a planet passing in front of it. This brightness change needs to be measured with exquisite accuracy to detect exoplanets. IRAC scientists have created a special type of observation to make such measurements, using single pixels within the camera. Another planet-finding technique that Spitzer uses, but was not designed for, is called microlensing. When a star passes in front of another star, the gravity of the first star can act as a lens, making the light from the more distant star appear brighter. Scientists are using microlensing to look for a blip in that brightening, which could mean that the foreground star has a planet orbiting it. Spitzer and the ground-based Polish Optical Gravitational Lensing Experiment (OGLE) were used together to find one of the most distant planets known outside the solar system, as reported in 2015. This type of investigation is made possible by Spitzer’s increasing distance from Earth, and could not have been done early in the mission. Understanding the early universe is another area where Spitzer has broken ground. IRAC was designed to detect remote galaxies roughly 12 billion light-years away -- so distant that their light has been traveling for roughly 88 percent of the history of the universe. But now, thanks to collaborations between Spitzer and NASA’s Hubble Space Telescope, scientists can peer even further into the past. The farthest galaxy ever seen, GN-z11, was characterized in a 2016 study using data from these telescopes. GN-z11 is about 13.4 billion light-years away, meaning its light has been traveling since 400 million years after the big bang. "When we designed the IRAC instrument, we didn't know those more distant galaxies existed," said Giovanni Fazio, principal investigator of IRAC, based at the Harvard Smithsonian Center for Astrophysics in Cambridge, Massachusetts. "The combination of the Hubble Space Telescope and Spitzer has been fantastic, with the telescopes working together to determine their distance, stellar mass and age." Closer to home, Spitzer advanced astronomers' understanding of Saturn when scientists using the observatory discovered the planet's largest ring in 2009. Most of the material in this ring -- consisting of ice and dust -- begins 3.7 million miles (6 million kilometers) from Saturn and extends about 7.4 million miles (12 million kilometers) beyond that. Though the ring doesn't reflect much visible light, making it difficult for Earth-based telescopes to see, Spitzer could detect the infrared glow from the cool dust. Spitzer reinvented itself in May 2009 with its warm mission, after the depletion of the liquid helium coolant that was chilling its instruments since August 2003. At the conclusion of the "cold mission," Spitzer’s Infrared Spectrograph and Multiband Imaging Photometer stopped working, but two of the four cameras in IRAC persisted. Since then, the spacecraft has made numerous discoveries despite operating in warmer conditions (which, at about minus 405 Fahrenheit or 30 Kelvin, is still cold by Earthly standards). "With the IRAC team and the Spitzer Science Center team working together, we've really learned how to operate the IRAC instrument better than we thought we could," Fazio said. "The telescope is also very stable and in an excellent orbit for observing a large part of the sky." Spitzer's Beyond mission phase will last until the commissioning phase of NASA's James Webb Space Telescope, currently planned to launch in October 2018. Spitzer is set to identify targets that Webb can later observe more intensely. "We are very excited to continue Spitzer in its Beyond phase. We fully expect new, exciting discoveries to be made over the next two-and-a-half years," said Suzanne Dodd, project manager for Spitzer, based at JPL.